Yay, I actually have a BSD related question. Sort of. I know nothing about BSD. I installed FreeNAS just to try it out. I tried it several years ago and didn’t like it. I’ve been running Fedora with ZFSonLinux since then, but I wanted to try something new. On that Fedora system the ZFS pool was always degraded because a disk had “too many errors.” I could never really determine if the disk was actually bad because SMART said it was fine. 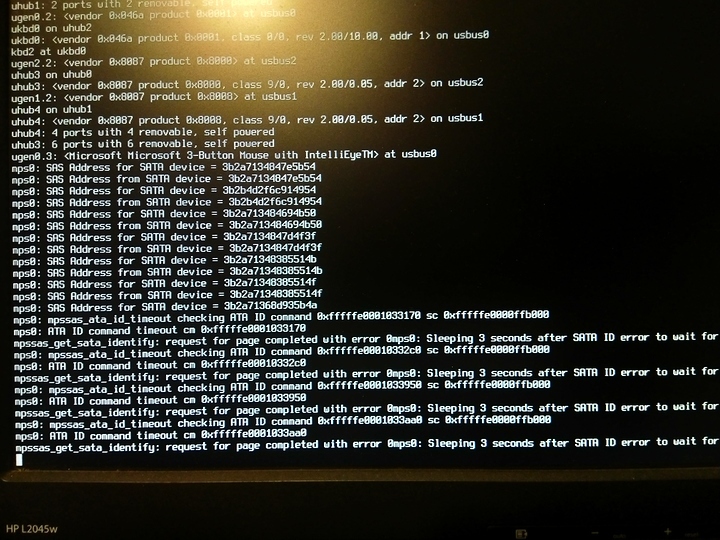 I’m assuming that drive is the one Fedora/ZFSonLinux was complaining about. Again, SMART says all the drives are fine. I ran a long test on them all. Is there a way to match that device ID to a drive once FreeNAS is running? There isn’t a device ID shown in the error, but try mpsutil show devices. The error itself is coming from the HBA trying to get an ID from a device and failing. The command might tell you which device is causing problems by process of elimination. I don’t have a problem, yet, but I am curious about ZFS and two drives of different speeds. The size is the same, 256 that equates to 224. But the speeds are off by 100 Mbps or so, on most benchmarks. I’m curious if a RAID1 will cause issues with this. I’ve read conflicting answers, but most answers have suggested that this isn’t a major issue. Welp. Just unplugged and replugged all eight SATA connectors into the two hotswap cages, both 8087 connectors to the HBA card, and removed and reinstalled all eight drives one at a time. No more error. Guess I don’t have a small BSD problem. Now on to making the pool. You probably won’t get very consistent performance, but it’s not going to break anything. Would it be better to just create two separate pools at RAID0 for each drive? any idea where to edit something to get pkg going? okay, so what am i missing? so i can resolve the hostname no problem with dig but when pkg gets at it, it cant resolve the hostname. I’m trying to install Gnome on rpi3b+ using pkg but it’s giving me libssl.so.8 not found, required by "pkg"
I reinstalled pkg several times and it still doesn’t work. Any ideas? Yeah, I also see that compiling from sauce is one of the recommended fixes. You do not have to be dealing with ports to install packages! beaten. but definitely, the handbook is great. I don’t remember exactly which commands I used. I tried using history, but I think I had to have had it setup beforehand?